There are many ways to enjoy exploring Ontario wine country – by car, by bicycle, by foot (lots of great hiking), and motorcycle. Though motorcyclists (bikers) will tell you that being on a bike (in good weather) is fun regardless of where they’re biking, they’ll also tell you that curvy, undulating roads and routes are especially enjoyable by bike. Fortunately, bikers will find that wine country has some especially nice rides. Ridge Road up the Escarpment and McNeilly Hill Road down: You can find this route by following signs to Ridge Road Estate Winery. Get off the QEW at Exit 78 (Fifty Road) and head south (sorry, this bit is pretty boring) until you get to Ridge Road. Ridge Road climbs quite steeply toward the top and has quite tight turns. From the winery continue on Ridge Road until you get to McNeilly Hill Road. Take McNeilly south. The surface on both Ridge Road and McNeilly leave something to be desired (though there are worse roads), but the ride is terrific. McNeilly offers amazing views as it takes you south down a 10% grade that has two hairpin curves and a 90-degree turn. Along Regional Road 81: This is a one of the most enjoyable routes on a bike. The long road meanders along the base of the Escarpment, dipping and curving here and there. Much of the road was re-surfaced over the summer of 2012, so it’s even lovelier than it used to be. From the west end Regional Road 81 is also known as Main Street (in Grimsby) and it turns into King Street just east of Grimsby. You can continue along Regional Road 81 past Jordan. Pelham Road: this road is part-way up the Escarpment (Henry of Pelham Family Estate Winery is on it). At the west end you can pick it up from Staff Avenue (south past Sue-Ann Staff Estate Winery) and take it all the way east past Fifth Street Louth and beyond First Street, where it pretty much turns into Glendale Ave.
Finding Alvento Winery coming from the east (from Nineteenth Street). Take Nineteenth Street south from Fourth Avenue in Jordan and just before you get to Main Street in Jordan Village, turn west onto Wismer Road (basically a one lane road heading further down into the valley). Follow Wismer until it turns into Twenty First Street and take it all the way up to Alvento. Quarry Road up from King Street to DeSousa Wine Cellars (in Beamsville). York Road in Niagara-on-the-Lake east to Ravine Vineyard and Five Rows Craft Wine. If you’re driving from the west, when you first get onto The County you get the impression it’s going to be kind of flat and a bit boring. But the further east you go, and the further you get off the Loyalist Parkway (County Road 33), the more varied the terrain. Closson Road, for example, is not the best paved (frost heaves and other bumps), but it’s curvy and enjoyable, as is Gilead. The Loyalist Parkway is a smooth ride and is scenic in its own way because it takes you through all the main towns of The County – first south to Wellington, then through Bloomfield, and directly through Picton, up to the Glenora Ferry and onto the mainland toward Kingston. The far east end of The County – North and South Marysburgh – has some of the nicest routes. From Black River toward South Bay and Half Moon Bay along County Road 13 is quite lovely, and along County Road 7 through the Devil’s Punchbowl is especially fun on a bike. Heading from Toronto north-west toward Holland Marsh Winery via Hwy. 27 is a very enjoyable ride (once you’re on 27, that is). Though it’s a highway, it’s fairly rural and scenic. Be sure to detour off Hwy. 27 following signs toward Kleinberg to check out the town of Kleinberg and the McMichael Gallery. From Holland Marsh it’s about 17 miles to Willow Springs Winery. Continue East along Hwy. 9 (Davis Drive, which is what Holland Marsh Winery is off of) toward Newmarket. Though Hwy. 9 through Newmarket is not very special, once you head south toward Willow Springs (for example, on Warden Avenue) you’re on undulating country roads through horse farm country. Dundas/Flamborough (outside Hamilton) – if you’re in the mood to check out something other than a winery, head toward Weir’s Lane Lavender in West Flamborough. The area has many conservation areas and lots of waterfalls, making for lots of interesting, curving roads. Take care, however, as there are blind spots and not all the roads are as smooth as you might like. If you’re a biker, chances are you’ve been to Port Dover – either for one of the Friday the 13th get-togethers, or just out of curiosity. The Port Dover area is an up-and-coming wine region (Lake Ontario South Coast wineries), and exploring it on bike is fun. 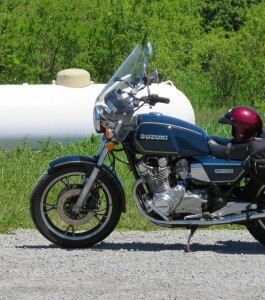 Indeed, driving along Lake Erie from Port Dover to the Turkey Point area is flat but it give you a nice view, and Front Road to Long Point Eco-Adventures and Burning Kiln Winery is a nice ride.